1. Walk, run or just relax in Lullwater Preserve. Lullwater Preserve, which includes the Emory president's home, offers a variety of paved and unpaved trails, woods, lawns, Candler Lake, a suspension bridge and much more — perfect for exercising or just relaxing with a picnic or good book. Curious about how far you’re walking or running? Emory’s Faculty Staff Assistance Program offers a map with the lengths of several routes. Lullwater is open during daylight hours. 2. Cool off at the Carlos Museum with free days for family and friends. The Carlos Museum is a jewel of Emory's campus, featuring fascinating permanent collections as well as temporary exhibits such as "Doorway to an Enlightened World: The Tibetan Shrine from the Alice S. Kandell Collection," on display through Nov. 27. Admission is always free for Emory faculty, staff and students, and you can bring guests for free every Thursday this month as part of the museum's 100 Free Days to mark its upcoming centennial in 2019. 3. Get back-to-school advice with workshops from the WorkLife Resource Center. Finding the best schools for your children can be stressful at any age, and especially when it is time to plan and apply for college. This month, the Emory WorkLife Resource Center launches its free, popular Back to School workshop series to help demystify the process. Packed with useful information, some sessions routinely fill to capacity, so register early. This year's schedule includes Understanding K-12 School Options (July 7), A Guide to Paying for College (July 14), The College Admission Process (July 28) and Saving for College (Aug. 4). 4. Take a lighter look at Shakespeare in Woodruff Library. From Barbie dolls to beer bottles, the Bard's influence is everywhere – the playwright who was pop culture in his day is still influencing pop culture today. View a variety of Shakespeare-themed items in the exhibit "A Goodly Commodity," which opened June 29 on Level 2 of Woodruff Library. The light-hearted display is one of many Shakespeare at Emory events leading up to the exhibit of the First Folio on campus in November. 5. "Rethink Your Drink," be more mindful or improve your strength. Emory's Faculty Staff Assistance Program offers a variety of interesting, free online webinars this month, so you can learn ways to improve your wellbeing without even having to leave your office. "Rethink Your Drink" (July 14, 19) is designed to help you stay hydrated; "Mindfulness 101" (July 12, 20, 26) gives you an introduction to mindfulness meditation; and "Strength Training Do's and Don'ts" (July 22, 28) will help you get the most out of your workouts. View the full calendar for times and registration information. 6. Learn about Erasmus' Greek New Testament as it turns 500 years old. Pitts Theology Library opens its summer exhibit, "A Most Perilous Journey: Erasmus' Greek New Testament at 500 Years," on July 15. Dutch humanist Desiderius Erasmus of Rotterdam (1466-1536) published the first Greek New Testament and a new Latin translation, a landmark event in the development of the Bible. The exhibit features all five editions of Erasmus’ Greek New Testament produced during his lifetime, allowing visitors to trace how the text changed over the decades. The exhibit is free and open to the public, with guided tours available. 7. Explore the Emory campus through a themed tour. Get some exercise while learning more about Emory by walking or biking as you follow one of the campus tour maps posted on the Sustainability Initiatives website. Build your map by checking options to include points of interest on topics including sustainable gardens, specimen trees, civil rights, art, historical markers and more. 8. Say goodbye to the Green Tara sand mandala. As Emory celebrated Tibet Week back in March, Buddhist monks spent hours each day crafting a sand mandala representing Green Tara. The meticulous creations are often destroyed as soon as they are completed to symbolize the impermanence of life, but this mandala has remained on display in the Michael C. Carlos Museum. 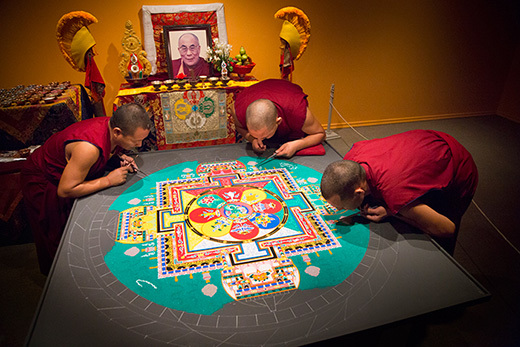 On Sunday, July 24, visit the museum for the Sand Mandala Closing Ceremony, which includes remarks from Geshe Dadul Namgyal and the destruction of this intricate work of art. The ceremony takes place at 2 p.m. in the third floor galleries. Museum admission is free for Emory faculty, staff and students. 9. Enjoy an ice cream social at the Emory Farmers Market. Held weekly during the academic year, the Emory Farmers Market goes monthly in the summer. Come out July 26 for an ice cream social featuring Honeysuckle Gelato. In addition, you can purchase fresh local produce, sustainably produced meat, bread, cheese and other artisan products. Weather permitting, the market will be open from 11 a.m. until 3 p.m. in front of Cox Hall. Spend as much as you like, but there are plenty of options for $10 or less. 10. See a film at the Fox Theatre. Emory employees are automatically eligible to receive discounts on a wide variety of events and retail items through the Sparkfly website, making it even more affordable to catch a flick from the Coca-Cola Summer Film Festival at the Fox Theatre. This month, enjoy the iconic atmosphere of the landmark theater while viewing "Shrek" on July 21 or "Rocky" on July 28. With the discount, tickets are only $8.